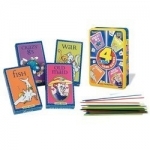 Old Maid is a fun little game that is especially popular with kids. It helps develop pattern-matching skills, as well as teaching children the value of playing by the rules, win or lose. 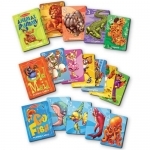 Old Maid can be played with a standard 52-card deck of playing cards, or with one of the specially-designed Old Maid decks that feature fun and colorful illustrations. Using a standard 52-card deck (if you don't have one of the specialized decks listed above), either remove one queen (in which case the remaining queen of the same color is the "Old Maid") or add a joker (which becomes the "Old Maid"). Deal the entire deck out, one at a time, to each player (it doesn't matter if the counts are uneven between players). Players examine their cards and lay off any pairs they may have of the same color, face up. The dealer then spreads his cards into a fan, face-down, and offers them to the player on his left. That player chooses one, and lays off any resulting pair. The process is then repeated, around the table, until one player is left with the Old Maid, and loses. Everyone else is a winner! Official rules to the game from Bicycle Playing Cards. Learn about the game, with rules and variations, from the free online encyclopedia.